As Viagra goes generic and the press descends, pharma giant launches a feel-good corporate campaign. Pfizer is staring down some thorny corporate challenges in the months ahead, including fallout from its efforts to circumvent US taxes with a doomed merger and the expiration of its Viagra patent. To boost its reputation, the drug company has launched a corporate ad campaign called "Driven to Discover the Cure." The new effort doesn’t mention any specific products, but instead focuses on five actual Pfizer scientists, the rigors of their research to discover new drugs and the positive impact that Pfizer ultimately has on customers’ lives. The campaign consists of a TV spot launched May 30, newspaper ads and online documentary-style videos at Pfizer.com/discover. "Medicines and vaccines are among the most powerful tools to extend and improve the lives of patients," said Neha Wadwa, global media relations representative, in an e-mail message. 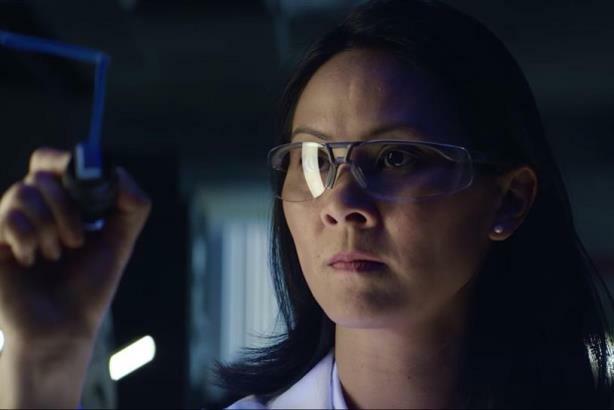 "Through ‘Driven to Discover the Cure,’ we are sharing more about who we are and how we innovate, through the stories of Pfizer science and scientists." Given the challenges facing the pharma industry, the ads seek to help more people understand what it really takes to bring new medicine to patients, in order to "create a better environment for discovering treatments," said the spokesperson. The 60-second spot, "Before it Became a Medicine," addresses the controversial question of why a new medicine is often so expensive. It begins with a man taking a pill from his medicine cabinet with his young son nearby. It then shows scientists getting the inspiration for that drug, followed by years of research setbacks, sleepless nights and 36 clinical trials. The timing of the work, which was created jointly by BBDO and CDM, is important for Pfizer. In April, the US-based drug maker scrapped a $160 billion deal to merge with Ireland-based Allergan, known for its Botox brand, amid charges that the merger helped Pfizer evade US taxes. The US Treasury passed a rule this year to prevent the tax benefits of such so-called inversion deals. Furthermore, the company’s blockbuster drug Viagra is due to become available in generic form in December 2017. Viagra generated about $1.14 billion in US sales last year and more than $2 billion worldwide for Pfizer, sales that are expected to plummet when people can buy a generic version of the famous little blue pill. A commercial showing how much work Pfizer puts into generating a drug like Viagra could help differentiate it from other companies that will soon be producing generics. The first of the campaign’s long-form videos features Pfizer cancer researcher Bob Abraham and cancer patient Matt Hiznay, who was helped by the drugs Abraham and his team developed. Hiznay is shown studying for his PhD so he can be also be a medical researcher. The pharma industry overall has watched its reputation decline in recent years, and the negative industry perceptions by consumers are often accompanied by the desire for more regulation, per market research company Ipsos. Nearly three of every four Americans want price controls placed on manufacturers of drugs and medical devices, a 2015 Harris Interactive poll revealed. That's up from 64% the previous year. John LaMattina, former president of Pfizer global R&D and author of the 2008 book Devalued and Distrusted: Can the Pharmaceutical Industry Restore its Broken Image? recently stated in Centerwatch Monthly that overcoming its poor image is the single biggest challenge facing the pharma industry today, even more important than R&D. He noted that lack of trust results in the public questioning the value of innovative drugs brought to market and gives credence to "attacks from media, legislators or regulators."